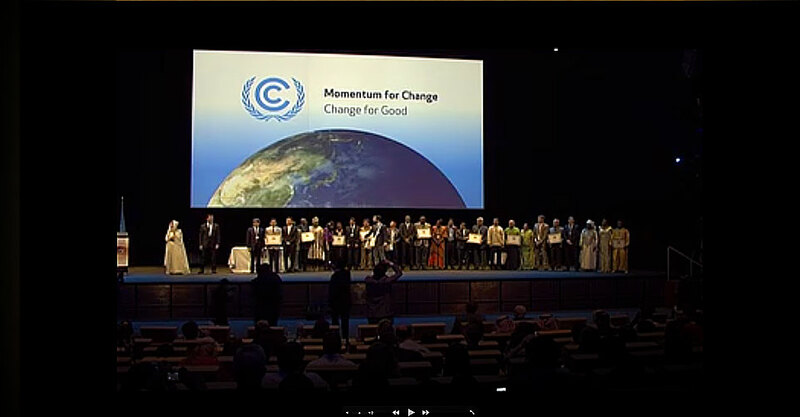 Once again I had the honor to be a very small part of a great event and initiative at the 2013 UN Climate Talks in Warsaw. 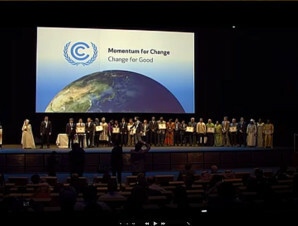 The initiative is called the ‘Momentum for Change: Lighthouse Activities’ and ‘aims to strengthen motivation, spur innovation and catalyse further change towards a low-emission, high resilient future.” The awards show began with inspiring speeches by Secretary General Ban Ki-moon and Christiana Figueres and then moved on to offering the award to the various individuals and project leaders. Obviously I didn’t find new ways to provide clean energy or figured out how to build beds from recycled materials, but I could do some music for the exciting awards ceremony and hope it offered some much deserved joy and appreciation for the award winners. Here is the Momentum for Change website and below are some of the tracks (the photo above is from last year’s event). Sincere thanks to the organizers for this nice opportunity.